A new type of driverless shuttle vehicle has been developed thanks to innovative computer vision guidance technology that enables the vehicle to locate itself on a roadway reliably and inexpensively. The technology, which is based on the use of simple video cameras, was developed by researchers at Institut Pascal (CNRS/Université Blaise Pascal de Clermont Ferrand/IFMA). It lies at the heart of the EZ-10 autonomous shuttle vehicle developed by Ligier Group, which will be unveiled at the Michelin Challenge Bibendum in Chengdu (China) from 11 to 14 November 2014. Since the 2000s, a number of companies have sought to make cars autonomous using expensive and sometimes unreliable technologies. In 2003, researchers at Institut Pascal decided to work on automated driving of urban electric vehicles using simple video cameras. The technology they developed is based on two stages. The aim of the first stage is to identify all the significant points in the immediate environment of the path followed, in a video recorded during an initial journey in which the vehicle is driven manually. The second stage corresponds to the automatic mode during which the vehicle continuously monitors its path, ensuring that the images provided by the on-board cameras correspond as far as possible to the sequence initially filmed. The initial video thus plays the role of a virtual track that the vehicle must follow when it travels in autonomous mode. 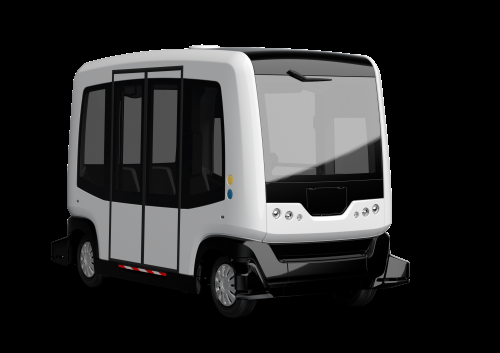 Since 2006, the researchers at Institut Pascal, in collaboration with Ligier Group, have been developing automatic driverless shuttle vehicles that can transport up to 10 people along short routes (in the region of one kilometer), rather like a horizontal elevator. The vehicles, which are designed to be used at specific sites such as industrial sites, airports and amusement parks, are able to deal with obstacles thanks to laser rangefinders fitted on all four sides of the vehicle. The shuttle vehicle can detect the presence of an obstacle at a distance of 50 meters and in this way modify its speed or even stop, depending on the potential danger. The researchers now intend to turn their attention to running a fleet of five vehicles at the Michelin Europe Technology Center at Ladoux. The aim is to deal with multiple and potentially simultaneous requests from call points or smartphones, in real time and on a large industrial site, rather like an automatic taxi service. The localization technology, which is reliable and inexpensive, will be unveiled at the Michelin Challenge Bibendum in Chengdu (China) from 11 to 14 November 2014. Equipped with an access ramp for people with reduced mobility, the new EZ-10 shuttle vehicle will provide visitors with a completely automated transport service.